1 Cherry Pie PS2 6th 10th 74,390 (8.1) 100% 243 Jul. 17, 2007, 11:43AM MAH CHERRY PIE! 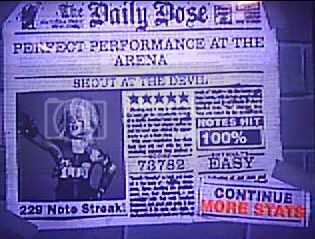 1 Trippin' On a Hole in a Paper Heart PS2 2nd 2nd 106,152 (7.9) 100% 350 Jul. 14, 2007, 12:41AM "Just let me be..."
1 Institutionalized PS2 18th 25th 159,040 (7.6) 100% 529 Aug. 4, 2007, 11:44PM I 'AM' CRAZY!